Mary Steratore pays tribute to the quiet consistency of friends in her sterling silver piece. You might interpret Mary Steratore’s piece as a devotion to each one-of-a-kind friendship like a star in the sky. But it also alludes to the quiet consistency of friends, like stars twinkling night after night. Mary crafts the unique pendant in her Pittsburgh studio, etching a sweet phrase into its sterling silver surface, and completing it with rock crystal and gold vermeil charms. Give one to the friend you had in mind while reading this. Handmade in Pennsylvania. This is for my best friend who lost her mother this summer. We've been best friends since kindergarten I live in Arkansas and she's back home in upstate New York. When I saw this I knew it would always remind her that I'm always with her or at least a phone call away any time of the day. 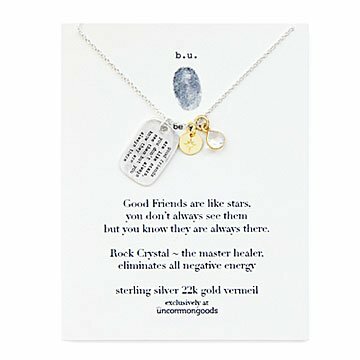 Perfect gift for a special friend! I was a little worried the actual pendant would be a little too big and not dainty and sleek, but it is actually very small and delicate which is beautiful. This was a wonderful gift and I will certainly be buying more gifts from UncommonGoods. I love this sweet little necklace. This is a super sweet little necklace. I thought it would be a bit bigger but I love the small size and think it is one of the reasons I love it so much.